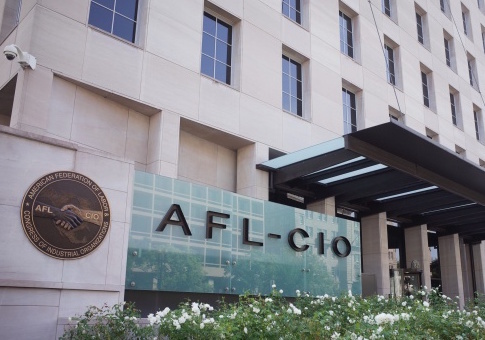 Workers at AFL-CIO's Washington, D.C., headquarters are fed up with the "anti-union" attitude of America's largest labor union. The janitors who empty the waste baskets at the AFL-CIO say the union fails to live up to its values. On Tuesday the cleaning staff voted to authorize a strike against the 12.4 million member union, a week after picketing in front of its Washington, D.C., headquarters. Office and Professional Employees International Union Local 2 (OPEIU), which falls under the AFL-CIO umbrella, called the labor giant's reputation into question, saying, "The AFL-CIO is anti-union" on its website. "The bargaining unit has voted unanimously to give strike authorization to OPEIU Local 2," the union said in an Oct. 9 post. The website goes on to say that the AFL-CIO's treatment of its own staffers could signify "the death of labor" in the United States. "The contract is dangerously hypocritical of the AFL-CIO, which is supposed to be a leader of unions," the site says. "If we agree to this contract, we are signaling to every other union out there that they should accept these terms from their employers." Officials with OPEIU's national office, as well as Local 2 did not respond to requests for comment. The dispute centers on what OPEIU members say is unjust treatment from the AFL-CIO, which took in more than $143 million in 2018, according to federal labor records. Local 2 represents 7,862 workers with much of its membership in the health care industry, and collected $3.8 million in 2017, according to the most recent records available. The smaller union has accused the labor giant of imposing an unjust contract upon its workers, employing the same tactics that it routinely criticizes private companies for using. "If a company tried to force a contract like this, we believe that the AFL-CIO would deplore the company as anti-union," the website says. "Management's contract signals to us that it does not value us or our work. They want to get rid of us." An AFL-CIO spokesman did not respond to an interview request about the strike authorization. Local 2 represents more than 50 workers—73 percent of whom have worked at the union for more than a decade—at the headquarters located a block from the White House. The union said its members are the "lowest paid" staffers in the complex due to their hourly pay structure. Despite already low wages, AFL-CIO management sought further cuts to employee benefits. Local 2 said management's proposed contract wanted to slash layoff notification, grant unlimited furlough time, and "significantly cut sick leave." The move against sick leave and other AFL-CIO demands led Local 2 officials to declare "the house of labor = the house of hypocrisy" on its website. The AFL-CIO has campaigned aggressively for paid sick leave mandates at the local, state, and federal level no matter the cost. "You shouldn't have to work while sick," an AFL-CIO website says. "When you have access to paid sick days, it makes everyone healthier and more productive." The union took the opposite approach when dealing with Local 2 negotiators, according to OPEIU. The staffers say they are still committed to fighting for employee rights. They hope AFL-CIO will live up to its own pledges to American workers. "Management pushed several proposals that completely contradict its mission to ‘work tirelessly to improve the lives of working people,' Local 2 said, linking to AFL-CIO's mission statement. "We know how the organization can improve, and we are part of the solution." OPEIU is prepared to continue the campaign beyond the strike authorization. It will hold another demonstration in front of union headquarters on Friday at 11:00 a.m. This entry was posted in Issues and tagged AFL-CIO, Big Labor, Unions. Bookmark the permalink.